A few nights ago the temperature soared to 59°F. I reveled by scraping away last season's ashes from the grill and barbequing a tight little (grassfed) boneless pork loin roast. Mmmmm. This cut is notably low in fat, so I sliced it almost wafer-thin and we ate it on sandwiches with spicy brown mustard and, mmmm, that grilled taste! I'm sorry ... this post is about the accompaniment, which after my succulent intro you might find tame. But I sure didn't. Raving over raw cabbage is usually the province of vegetarians. What can I say, I like vegetables. 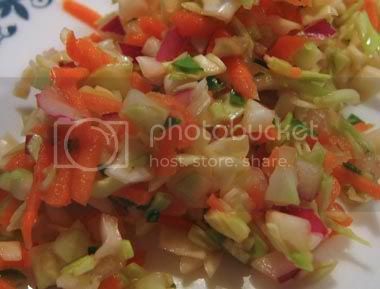 The term "cole slaw" comes from the Dutch "koolsla", meaning "cool cabbage". Apart from containing some amount of uncooked red or white cabbage and a dressing, the variations are endless. Carrots impart just the right amount of sweetness so I can forego added sugar. They also up the carotenoid content (see vitamin A amount). And I love the confetti color. 1 Toss all ingredients together. Let sit at room temperature for about an hour to let the cabbage wilt and the flavors meld. Stir periodically. Note: I've tried making this with a small amount of oil, a la vinaigrette, but the cabbage lacked crunch and no matter how little I used, the mouth feel was oily. That's just my taste though. Don't let it stop you from experimenting.